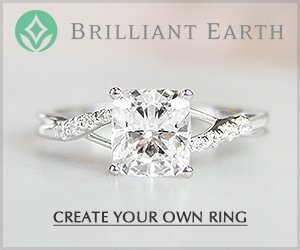 Black onyx rings hold a striking gemstone that has been used throughout time to create enticing men's rings as well as unique women's rings. As a durable and long lasting gemstone, black onyx is a suitable gemstone for use in women's and men's wedding rings and engagement rings. To find out more about this beautiful gemstone, check out the info below which includes black onyx properties, the difference between natural black onyx and black agate onyx, special care and tips which will help you to find the right rings for the right price. 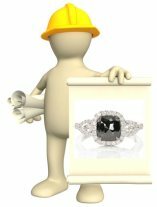 And if you have any questions about black onyx engagement rings or wedding bands, just send them in through the comment and question box at the end of the page! Black onyx is an abundant gemstone that looks absolutely ravishing in any number of cuts and styles, and rings made with this lustrous gemstone are available in a wide range of prices - black onyx engagement rings and wedding bands can also stand up well to daily wear. 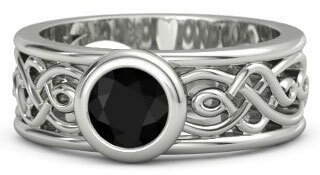 Black onyx is a gemstone of protection and balance. It is believed that black onyx has the ability to reflect negative energies and emotions away from the wearer, and to promote physical well being and balanced emotions. Onyx is the classic birthstone for the month of July. Two types of black onyx may be used for black onyx rings: natural black onyx and agate black onyx. 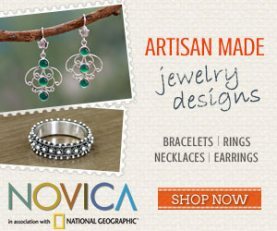 Natural black onyx is a form of chalcedony quartz and agate black onyx is a form of chalcedony quartz too - the difference between natural and agate onyx has to do with color. Natural black onyx is black naturally, although its colors are often interrupted by lighter colored bands. Agate comes in many colors, but it is artificially dyed black to obtain most of the black onyx sold in today's black onyx jewelry. Black agate onyx is often preferred by consumers who are looking for a perfectly solid black onyx, and consumers who prefer lighter colored bands or white bands in their black onyx may prefer naturally occurring black onyx. Natural black onyx and black agate onyx have practically the same types of physical properties, so in terms of durability and wear one is no better than the other. As the price of onyx relies heavily on how the stone is cut and used in a ring, there is not much of a price difference between these two forms of onyx either. Natural black onyx receives no treatments or enhancements. Agate which has been dyed black has an excellent stability rating and is labeled as D agate or D black onyx. 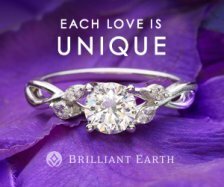 As with most gemstone rings, it is best to forgo white gold as this type of metal will need occasional rhodium plate treatments to maintain its white shine - and these types of treatments can be harsh on gemstones. Instead, for black onyx rings it is best to stick with metals like sterling silver, yellow or rose gold, palladium or platinum. 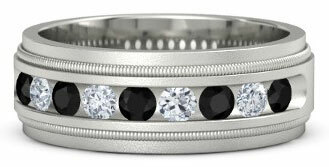 Black onyx looks fabulous in any cut! Natural black onyx and agate black onyx require minimal special care. 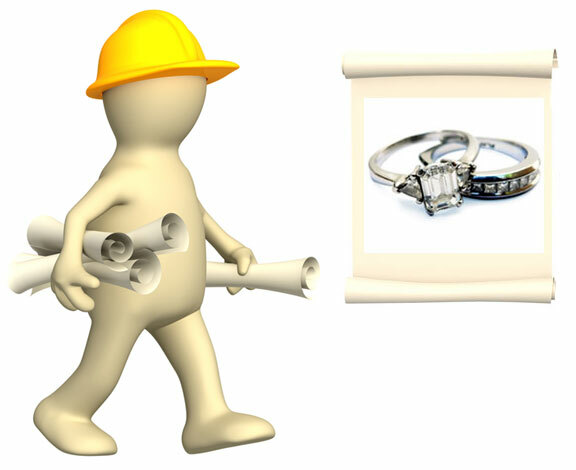 These gemstones may chip or scratch if they are exposed to hard knocks, but as long as the stone is in a protective setting any possible risks for damage can be minimized. 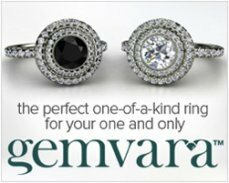 Top Black Onyx Ring Picks by Gemvara! As naturally occurring black onyx and dyed agate black onyx are quite plentiful in nature, they are extremely affordable gemstones. 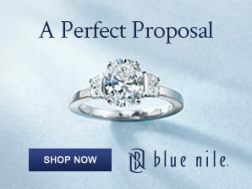 Price per carat averages around $9.00 or less, and the value of the stone does not increase much with larger carat sizes. 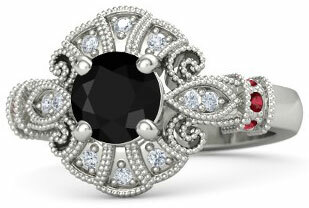 Black onyx rings are valued on a large part by how the gemstone is cut, carved, and set in the ring. Black onyx gemstones with custom cuts, detailed carvings, and custom settings will all fetch much higher prices than a commercial cut and set stone. Black onyx is also often paired with diamonds and platinum or palladium, and colorful gemstones which form striking contrasts with the black gemstone, and these materials can dramatically increase the value and price of a black onyx ring. 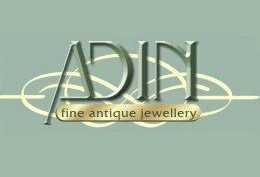 When you are shopping for a black onyx ring it is best to take the time to comparison shop - check out a number of different retailers, and always purchase your ring from a reliable seller. 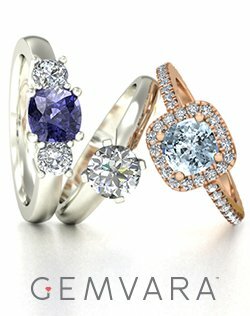 EWR's favorite jeweler for black onyx ring styles is Gemvara - and this a great place to start your search for rings made with silver, platinum, palladium, gold and with diamonds or colored gemstones. 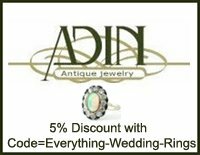 Shopping for this gemstone can be a bit tricky, because a black onyx ring is valued largely on cut plus workmanship quality - and the condition of other materials used in the ring including diamonds, gemstones and metals. 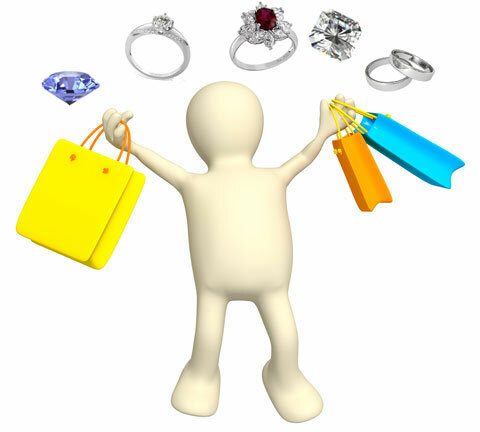 As a result, shoppers can end up purchasing a less than satisfactory cut black onyx ring for a hefty price. 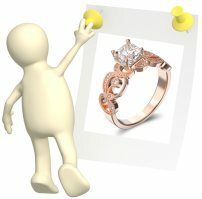 This is why it is so important to stick with reputable jewelers, retailers and boutiques - and make sure your ring comes with a no-nonsense return policy. 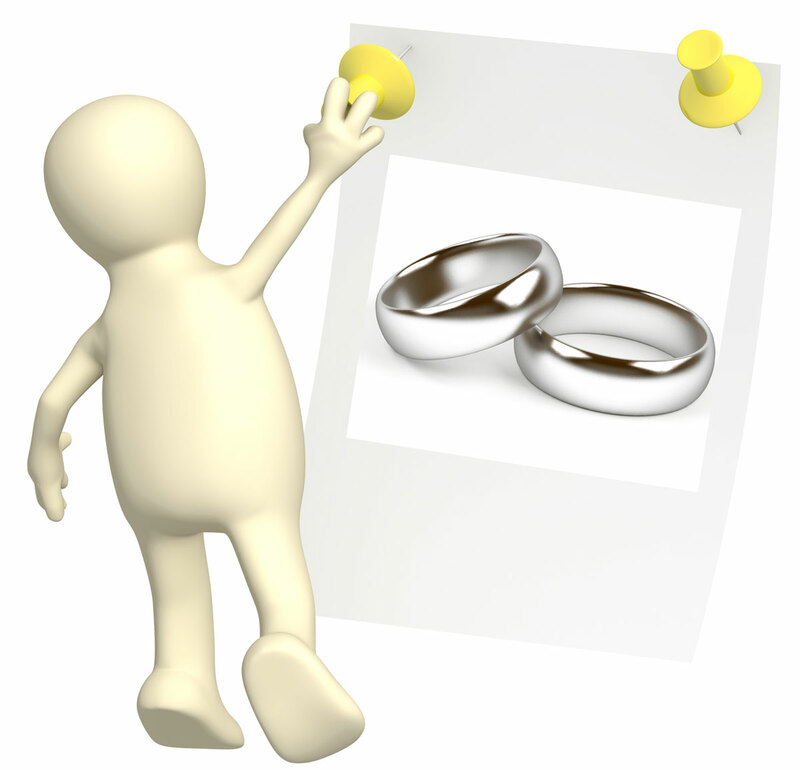 (Then, you can always have the ring checked out by a local gemologist, and return the ring if you are not happy with the ring's analysis). 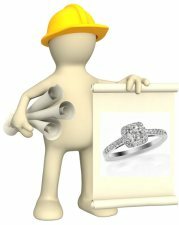 Men's black onyx rings, and onyx wedding or engagement rings which are worn on a daily basis, will hold up to long term wear as long as they are paired with durable metals such as titanium, tungsten, palladium, platinum and yellow or rose 14k or 18k gold. A sterling silver black onyx ring is an excellent affordable option to palladium and platinum rings - and silver black onyx ring styles are available in much more intricate and detailed styles than titanium or tungsten rings. 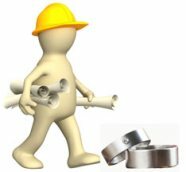 But, silver rings do require a little TLC to remain in good condition - especially if they are going to be used for every day wear. 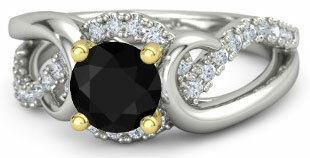 Do you have questions or comments about black onyx rings? 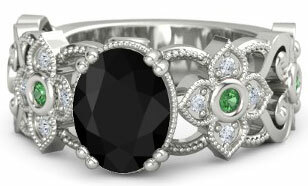 Send in your questions and comments or share pics of your favorite black onyx rings! 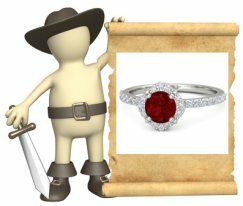 Find out more about Gemstone Appraisal and how Gems are valued here! More Top Black Onyx Ring Picks!